What are the most used emotes? What should be your very first emotes? Twitch Emote Advice – What Makes A Great Emote? What makes a good or great emote? Earlier we covered 5 Best places for Custom Twitch Emotes and How to Make Twitch Emotes in the blog. Today’s topic is really interesting and really important things to take into consideration while choosing the right emotes for your channel. Emotes on Your Twitch channel have a huge impact in your stream and outside your stream that you should think about. You don’t want your emotes to be unused.. Right? Wild4Games has created an awesome video about this subject that everyone should take a look at before getting paid emotes or doing your own emotes. Do you wanna know the top emotes used today? Check out Twitchemotes.com with detailed stats. Do you already know a competitor streamer that has the same kind of viewers and would like to choose just the right and most used emotes? With Twitchemotes.com you can actually dig up the most used emotes by channel. Before i let Wild4Games give his amazing tips. I would like to share you my thoughts after watching and helping out streamers with these kinds of things. Emotes should convey a feeling.. Most feelings that i have seen are coming from Helloo, Kappa, Fail.. So your very first emote should be “Hey emote”.. Why? Because people will most likely use that in your streams and in other’s streams if it’s a good and funny emote. Kappa kind of emote is just good to use in every place you feel trollish.. Fail is for moments when something bad happens in your or someone else’s streams. – What makes a good Twitch emote? 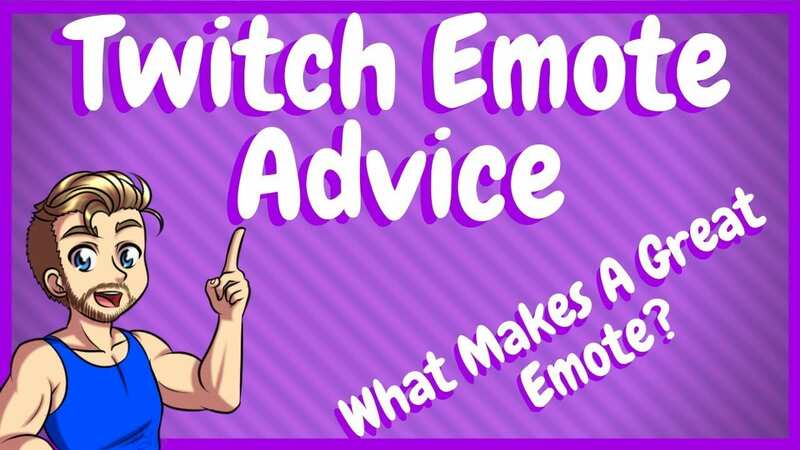 In this video right here, I’m gonna give you the best Twitch emote advice you’re ever gonna get anywhere. And we’re getting started right now. Hey, it’s me. It’s Wild coming at you for my Stream Support playlist where I give you the best tips and tricks. And if this is your first time here and you wanna learn how to grow and improve your stream, make sure you hit that big, red subscribe button and tick that bell so you know when my videos go live for you. This video is all about everything emotes. And more importantly, it’s gonna concentrate on what makes a good, or great emote, on platforms like Twitch, Youtube, and Mixer. And this is super critical because the difference between a good emote and an average emote can make the difference between keeping a subscriber or even obtaining a new one. And last time I checked, having subscribers was an awesome thing to have. So if you’ve seen my past Twitch videos, you’ve known that I’ve gone to TwitchCon numerous times which means I’ve had some very unique and awesome experiences there. But one of the most unique ones is I actually, by blind or even just dumb luck, had one of the higher Twitch support members stop by my booth at the same time I had a Twitch partner who basically made most of the Twitch emotes for a lot of partners out there. And because they stopped by at the same time, we got to have an awesome conversation about Twitch emotes and I got to pick their brain and I got some awesome information that I wanna pass off to you that comes from probably the best sources you’re ever gonna hear out there. All of the information that I was able to obtain from these people is awesome, golden, top-notch advice that I wanna share with you. So make sure you take down notes and just for a little tease, if you stick around all the way to the end of this video, I’m gonna tell you a little special surprise. Secret number one. Clarity is key. So everyone gets super jazzed when they’re allowed to have emotes on Twitch, whether they got to be partner or an affiliate. But the biggest mistake that most streamers make is they try to jam way too much into a small image. When you try to pack way too much into a very small space, the only thing you’re gonna be left with is a pixelated blob that nobody’s gonna know what it is, making it very useless for you and your community. Hence, you basically just wasted money, you wasted time, and you wasted your effort, and you could lose subscribers off of it. You wanna make sure your image is nice, crystal clear, has a lot of clarity, and is clean so when people see it, they know exactly what it is. Secret number two is we wanna make sure our emotes are vivid. So how do we get a vivid image? Well it comes down to the three Cs. We wanna concentrate on color, contrast, and content. When you’re concentrating on the three Cs, you wanna make sure your colors pop and mesh well for your channel art, and work well for you and your community. When you’re thinking about contrast, that’s basically just having brights against darks. Remember, you have two types of viewers that watch your channel. Some that will watch in light mode and some that will watch in dark mode. So you wanna make sure your emotes work good for on a white background and on a black background, and that they have contrasting colors to make them pop more for the human eye. And last but not least, you wanna make sure content is on point. Remember, these are your emotes. So the content should be generally about you and your community. If you make it too generalized, it’s gonna get lost amongst the masses. So you wanna make sure the content is refined to you and your community. Secret number three is all about community engagement of your emotes. Emotes that engage your community to constantly use them are kinda like a cornerstone of your channel. And this will let you know if you’re gonna have a great emote. But what makes an emote engaging for them to constantly use it in your channel? Well this comes down to two factors. Factor number one is easy. You wanna see how proud and happy people are to use your emotes in other channels. If people love using your emote in other channels, this is a great indication that you have an awesome emote which equals the fact that you’re gonna have viewers that are gonna retain their subscription because the emote that you have. Which means you’re gonna have awesome resubscriber retention. This part also has some really cool flip side to it. If you’re in there channels and you see nobody really using your emote or having fun with it, it maybe a really good time to consider refining or completely redoing your emotes. And if you’re no sure what you wanna do, you know, take some input from your community and see how you can improve, refine, redo to create a bigger impact on your emotes. The second factor to this secret is quite simple. If you have a community, or viewers, or subscribers that are really happy to use your emotes in other channels, you get an awesome kicker. You’re basically getting your brand out there to the masses and other channels. And this has an awesome side effect. If your personal branding is awesome and people love it, you would be surprised at how many times people click on a emote that will lead back to your channel, and they’ll subscribe to you just to have that awesome emote as well. Let me tell you, this happens an awful lot. So this is one of the cool reasons that you need to pay attention to this whole list. And for an extra bro note on this, think about how many times people gift out subscriptions. If somebody else in another channel really likes your emotes, you know that people from your channel, your community can gift a sub to them and then boom! They can start using your emotes and having fun with them. And they may even continue the subscription now that they’re having fun and they feel apart of your community. This has a whole plethora of bonuses. Secret number four is all about how exclusive and unique your emotes are gonna be. We all know the main reason viewers subscribe to you on Twitch, they wanna help you for all the awesome content that you’re producing that you’re putting out for them. But I bet you didn’t know the second main reason that people are willing to subscribe to you on Twitch, Youtube, and Mixer is because they want exclusive and unique access to your emotes that they can only get through your channel. And you really need to take strong advantage of these two key terms. Exclusive and uniqueness. Do me a favor. Look at your emotes. What makes you different from all the big and small streamers that have emotes out there already? A lot of us struggle and when we have the ability to make and push emotes out there, we rush the process and we don’t put a lot of consideration into what we should have that makes us separate or unique from everybody else out there. I mean, let’s think about this. When you go to a lot of streamers out there, how many hello emotes do you see? How many lurk emotes do you see? How many hype emotes do you see? How many bye emotes do you see? Ton and tons. And that doesn’t make you different. You’re already making something that is saturated in a market with hundreds of thousands of other people out there. And this is the point I wanna drive home, the market is over saturated with general emotes. And you wanna make sure that yours are unique and exclusive. This is the reason why. Think about it. There’s gonna be a time when a viewer or subscriber out there has to pick and choose between you and some of the other subscriptions that they have. And if your emotes are just generalized and it’s like all the other people out there, there’s a strong chance they’re gonna drop you and hold on to them. But if your emotes are unique and exclusive for the platform out there, they’re gonna hold on to you and most likely drop them. Which means, you’re gonna have awesome subscriber retention which is what this whole thing is about. And like we said again, subscriber retention is OP. Now I’m not saying you can’t do general emotes. There’s a lot of cool ones out there and if you wanna do an hello, or a love, or a bye, or a lurk, or a gazimo, you totally can, it’s your channel. I’m just giving you a little bit of advice. If you do go along that route and you wanna do generalized emotes, put your own flare and personalized touch to them. And that’s gonna lead us into our next secret. Secret number five is all about personal branding and making your emotes identifiable. One of the most powerful traits you can give your emotes is giving them that personal branding touch which will make them identifiable across all streaming platforms. A great example of this is my own channel graphics that I use right here on this Youtube channel. I mean think about it. How many times ave you guys scrolled trough Youtube around something that’s around my category and you see my personal branding, my personal logo, my personal flare, my personal touch? And you know right off the bat that’s a Wild4Games video. The same thing is done with emotes. If you have these personal touches that are identifiable to you and your stream, people are gonna know that that’s your emote, giving you personal branding. And when you add personal branding to your emotes, it makes them identifiable which makes the also have more authority across streaming platforms. People are gonna know at a glance that it’s your emote. Now there is a problem with this tip and I think a lot of you are gonna know it right off the bat. What if I don’t have personal branding? You could be a small or medium streamer that really hasn’t grown into that. Heck, you could be a big streamer that’s variety and you encompass a lot of things and you haven’t really refined it down. Sadly, personal branding comes in time and it takes a lot of time to build. Now, I can do a whole video on this and if you guys are interested in it, leave a comment below and I will see what I can do to create a cool, personal branding video for you guys to help build, but this is something that you’re gonna have to build and refine on your own. But if you need some tips on where to start, that I can help you with. For our first quick tip, you wanna consider color and keeping it consistent and uniform across all of your emotes. Let’s take this into consideration. When you think of Youtube, what color comes to mind? It’s red. When you think of Twitch, what about that color? Well it’s purple. What about when you think of Pepsi? Well it’s obviously Pepsi blue. And those have strong feelings and emotions that carry brand through a lot of things and you can start doing that on yours. Think about what colors you want people to identify with you. For instance, I like to use a lot of blues. For a second quick personal branding tip, think about having a theme or a mascot. I mean, this is really simple. If you have something that you always talk about on your stream, you can center your personal branding around that and have fun with it. It could be something that’s way eccentric or something that’s personal to you. Or heck, it could be whimsical, funny, or even lewd. As long as you have fun with it and you build something around it that resonates with your community, it’ll do awesome. And the same thing could be said about a mascot. Maybe you like pandas or sharks. It could be a bunch of things like that that you can have fun with and keep everything centric around that. And for the last quick tip on personal branding, don’t forget you’re your own personal branding. I myself Wild4Games, my own face, my own body represents my brand. So don’t be afraid to use your body and face. Now I know this is tough for a lot of people. You can be shy or you feel differently about how you look on camera or appearances like that, so this one may not be for everybody, but don’t be afraid to push yourself out there and break down those walls ’cause a lot of people love sharing you ’cause they fall in love with you and your community and wanna help you grow. And spreading your face around might be one of the best ways to do it. With all this emote advice, with all these cool secrets, tips, and tricks, take some time to consider what you wanna do for your emotes. A lot of people, they rush really quick like we said before. Take a moment, see what’s gonna resonate with you and your community. Now you’re probably asking, well I don’t know where to get emotes done. How do I go about this? I got you covered. In my next video, I’m gonna show you the best place to get Twitch emotes done that’s gonna be best represented for you and your community that’s gonna have an impact, it’s gonna have great professionalism, it’s gonna show you a wide variety of spots you can get ’em from, and price affordability. So if you haven’t had a chance make sure you hit that subscribe button below and tick that bell ’cause that video will be coming out shortly. Now if you need even more Twitch emote advice, I got you still covered on that. I said I had a surprise and here it is. I’m gonna give out two free emote commissions from my friends to all off you out there. You guy have been super awesome and been helping me grow with my channel authority. Now there are some rules and regulations, will be explained in the next Twitch emote video which I will link in the top of the Youtube card when it’s ready so it’ll be right up there, or in the show notes below. But it will require some certain things like making a comment in the show notes on this video and the next one, following me on Twitter, following me on Twitch, following me on Instagram, those will all get you more entries into the competition there. But I’m gonna give away two free emote commissions that I will pay out of my pocketbook that’ll be sent to you of any personalized commission that you want. So it’s a really cool, awesome thing that I’m gonna try to hand out to all you guys to say thank you for helping me out and growing this channel. If you guys liked this video, make sure you give it a nice thumbs up and leave a comment below on what you think makes a great Twitch emote. And if you wanna help me and this channel, and my Twitch channel, and everything else grow, make sure you follow me on my social media on Twitter and Instagram to keep up with this channel and all of my art. And if you wanna be a true bro or a bae, and you wanna help support me in any way, make sure you follow me on Twitch.tv/Wild4Games and if you wanna help out even a little more, you can hit that almighty sub button. Thank you guys for watching. Make sure you checkout the next Twitch emote coming out real soon. I will see you all coming up in the next stream support video coming out real soon. Take care all, peace. Credits and +1 rep: For Wild4Games.. He shares really good tips and does guides in his YouTube channel. Make sure to follow him for even faster guideness with Twitch.